Can Atlético Madrid topple its Spanish rivals and conquer Europe? Atlético Madrid is the third-most successful club in the history of Spanish soccer, which is a little like being the third-most famous khan in the history of the Mongol horde. Good job by you, but you’re never going to stop hearing about Genghis and Kublai. Atleti has won nine titles in La Liga, Spain’s top division, which is great, except that Real Madrid and FC Barcelona have combined for 54. And when you start running the math on that, and realize there have only ever been 82 champions crowned in La Liga, and add in that Madrid and Barcelona have collectively finished second an additional 45 times (versus eight for Atlético), and further consider that Atleti isn’t even the biggest team in its own hometown (that would be Real) — well, you get a clear picture of a tough little club that’s been overshadowed by its planet-conquering, culture-altering rivals. But not anymore. At least not this year, at least not depending on how the next two weeks shake out. Atlético has two games remaining, one against Barcelona and one against Real Madrid. If they beat or draw with Barcelona on Saturday,1 they win their 10th La Liga title. If they beat Real the following week, they win their first-ever European Cup. If they lose either match, the opponent takes the prize. So no biggie, then. Just a two-week stretch when they can either complete the greatest season in their history, becoming champions of Everything Everywhere while spoiling their rivals’ chance to do the same — or be wet-willied back into oblivion by the smirking older brothers who’ve tormented them since the beginning of time. It’s an impossibly fascinating moment for a club no one picked to topple the order of soccer in Madrid, much less in Europe, this year.2 And it’s doubly fascinating because Atlético has made this happen essentially by taking everything Barça and Real stand for and forging itself into the opposite, the way Rocky sparred with flank steak while Apollo Creed was out ermine shopping or whatever. Barcelona and Madrid dominate by acting like the world-bestriding colossi they are; Atleti has managed to dominate by playing the game of an outmatched underdog to near perfection. Let’s take their second match first, the Champions League final against hated crosstown rival/fascist-plaything-haha-maybe-not-but-kind-of Real.3 Since the world began, or at least since David Beckham had a ponytail, Madrid has built teams by showering global superstars with gaudy fortunes. In its run to this year’s Champions League final, Carlo Ancelotti’s team has ridden goals from players like Cristiano Ronaldo ($130 million-plus) and Gareth Bale (instead of a dollar figure, picture Boardwalk and Park Place under a pile of hotels). Atleti, by contrast, is a team of short-termers and castoffs. It bought David Villa at a yard-sale price after Barcelona got tired of him. Its leading scorer, Diego Costa, has already been sold to Chelsea for a reported £32 million. The Champions League final will be his last game with the club. Overall, Atlético has made more than it’s spent on transfer dealings in the last five years, which last happened at Real on — well, it’s been a little while. It doesn’t scan as a great strategy. It scans as a survival tactic. But look, here’s Atleti’s record in five matches so far this season against Barcelona: zero losses, four draws, and one huge win that knocked the bigger club out of the Champions League quarterfinals. A win and a draw against Real Madrid in La Liga — as well as, OK, a couple of bad losses in the Copa del Rey, but Atleti is playing for the championship of Europe; it needs a Copa del Rey like Batman needs a police cruiser. A 3-1 win over Chelsea, at Stamford Bridge no less, in the semifinals of the Champions League. It works because the defense has been a curtain wall, because the squad is intensely physical, because Simeone has managed his rotation deftly.5 It works because rattling the ball ahead to wherever Diego Costa is crashing through space turns out to be a non-terrible way to obtain soccer points. It works because, with this team, all the little things that have to go right for a smaller club to contend with one on the Forbes “Most Valuable” list keep going right, over and over again. So Atleti makes for a great story. But there’s a good chance, maybe better than good, that the club will lose both its climactic games. Against Real Madrid … well, the matchup advantage Atlético arguably owns against Barcelona doesn’t really translate when the opponent is an enormous slingshot that fires out Bale and Ronaldo. There’s a reason Atleti lost 5-0, on aggregate over two legs, to this Madrid team in the Copa. If your loyalty’s up for grabs, should you root for these guys? It’s not the easiest call, actually. The underdog story is hugely appealing, but if you care about soccer not being boring, or at least not being a herky-jerky, stop-start smackfest, then I’m sorry, Mr. Wenger, but Atlético is not your beau ideal. 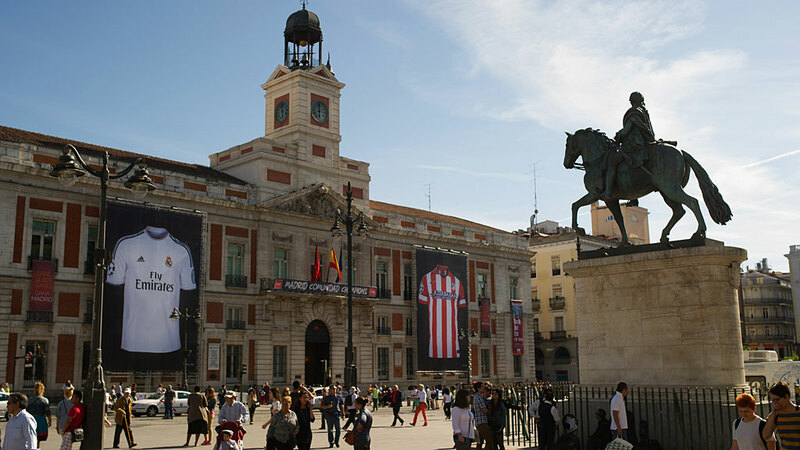 There’s also the fact that a subset of Atleti fans has a reputation for racism that stands out even in a country where soccer fans’ rhetoric on race only occasionally surpasses the sophistication of a Confederate dinner party. They’ve had an incident just this month, when the Levante midfielder Papakouli Diop danced in front of fans after being targeted with monkey chants while taking a stoppage-time corner. And I mean, it’s madness, on some level, rooting against a fan base; every Spanish club has its ugly elements, plus Osama bin Laden loved Arsenal, where do you draw the line, etc. But it’s tough to want any outcome, even a meaningless sports outcome, that’s going to make this slice of the Atlético supporter base happy. And then, well, it’s a much smaller thing, but if you’re looking for reasons to keep off the bandwagon, Diego Costa rubs some people the wrong way — notably the entire football federation of Brazil, which wants him stripped of his citizenship after what it sees as his mercenary decision to play for Spain. Plus he dives. I mean, OK, everyone dives; Costa spends a meaningful portion of his time on the soccer pitch enacting a window-washing tragedy. Watching him, you get the sense of someone who’s going to claw his way to a better place no matter what ends up under his fingernails, which you’ll either want to root for or you won’t. Against all that, put the total chaos that will be unleashed across European soccer if Atlético Madrid wins a continental double with a team it bought dirt cheap and can’t even pretend to be able to keep together. The novelty value of having a team outside the Roman Abramovich Yacht Circle running through the streets with torches. The A-Team thrill of seeing an improbable plan well executed. The not-unfunny prospect of a summer of Barcelona and Madrid rage-contortions playing out across the tabloids of the world. Personally, I’m kind of hoping they do it. I can’t tell you how much of this has to do with Atleti’s shirt sponsor being Azerbaijan — not Azerbaijan the imaginary luxe-deluxe casino your brain just invented in Dubai; I mean Azerbaijan the country. “Azerbaijan: Land of Fire,” that’s what it says on their shirts. Like, a tourism thing. It’s in English. Never doesn’t make me chuckle to see that peeping out after a goal celebration. Iranian newspapers Photoshop it out when they carry Atlético match images. I’m not saying you should be like me. It’s just, this club has a sideways aura I can’t help but find endearing. Its team crest includes a silhouette of a bear climbing a strawberry tree. It’s the city symbol of Madrid, but still: bear! Strawberry tree! Earlier this season, they prompted a British paper6 to run the headline “Atletico Madrid’s Diego Costa suffers horror injury7 .. after being MOONED by fan.”8 How did they decide what to capitalize in that sentence? Atleti is nobody’s darling, but the club’s implausible vengeance trail is the best story left in soccer before the World Cup starts. And this sport can get so predictable. Sometimes you just want to turn your expectations off and watch the world, very goofily, burn. They’re currently three points ahead of Barcelona in the table, but a Barça win would give the title to the Catalan club thanks to its head-to-head record against Atlético. Last season, Atleti finished third in the league and won the Copa del Rey — but third still meant 24 points behind Barça, and they lost one of the best strikers in the world, Radamel Falcao, to Monaco in the transfer season. Overly Simplified History Korner: Early on during Franco’s rule, Atleti was kind of a company club through its association with the Spanish Air Force, but Franco’s subsequent use of Real’s glamour as propaganda gave Atlético an antiestablishment air that it hasn’t totally lost. There’s a faint right-wing/left-wing conflict that’s still traceable through the deep backstory of the rivalry, but the layers of the rivalry are too complicated now for that distinction to be of much use. More on this in a bit. Translate that into Latin and put it on a shield with a ball-peen hammer and you’ve got the Defensive Midfielder’s Union letterhead crest. Particularly during the stretches when Costa has been injured. Editor’s note: Oh yes he was.